I wanted an outdoor party, but hesitated because weather can be such an unknown. I ended up finding an indoor space available for rent that was right at one of our favorite playgrounds and booked right away because I knew it would work perfect for our Picnic Party at the park. I hadn’t actually seen the inside of the rental space before the party day, so I planned my decorations just hoping everything would work out accordingly. 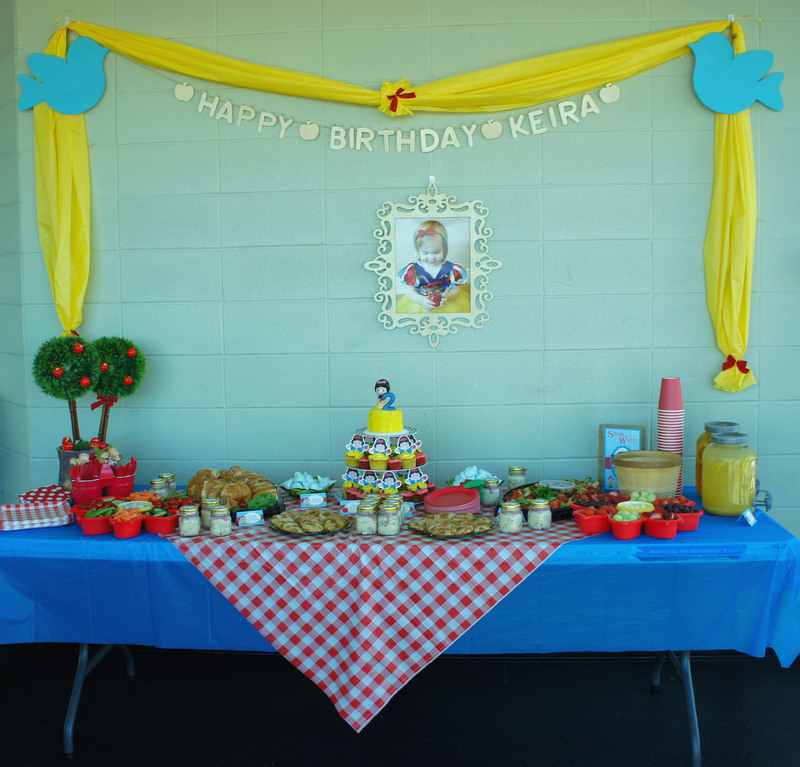 The backdrop of my table was made up of large wooden birds (found at Dollarama) holding a swag of yellow plastic tablecloth and a birthday banner I created from wooden letters and apple shapes hung on a line. The overall effect is exactly what I was wanting and added that princessy touch to an otherwise boring space. In the center behind the table, I used the same image from the party invites, and set it inside an ornate wooden frame from Micheals. 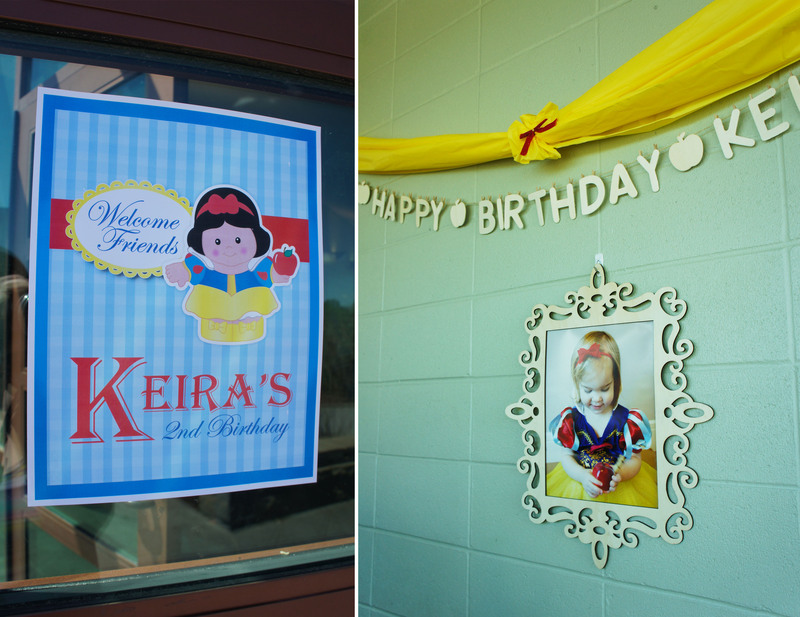 I ended up getting quite a few cute shots from my photoshoot with Keira in her Snow White Dress so I also printed those and slipped them into frames as part of the table centerpieces. The table centerpieces were small blue buckets, filled with yellow flowers I crafted from pool noodles and pipe cleaners. I also added red ribbon to each bucket to mimic the sleeve’s of Snow White’s dress. On the food table, I had an adorable planter pot with some of the Dwarfs on it that I filled with apple trees using fake trees and materials I had around the house from other parties. 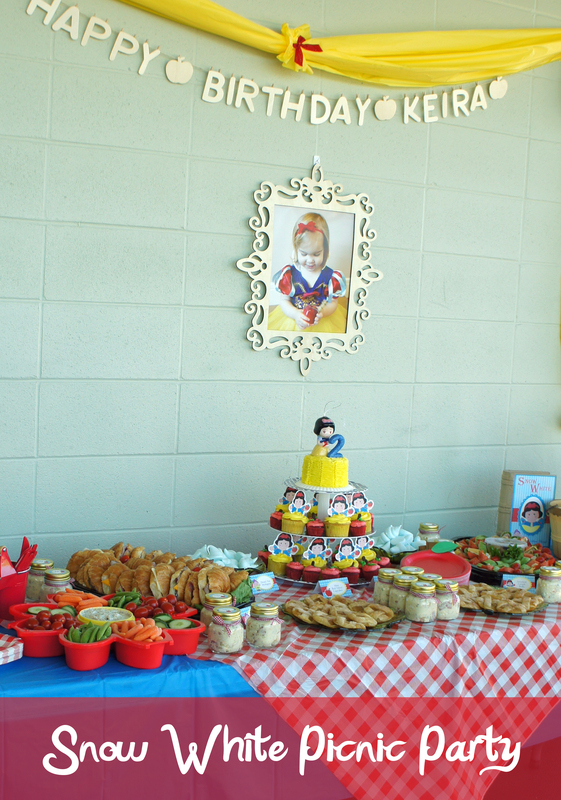 Party food to satisfy both adults and toddlers can be tricky so I decided to split it up this time around and cater to each age set. 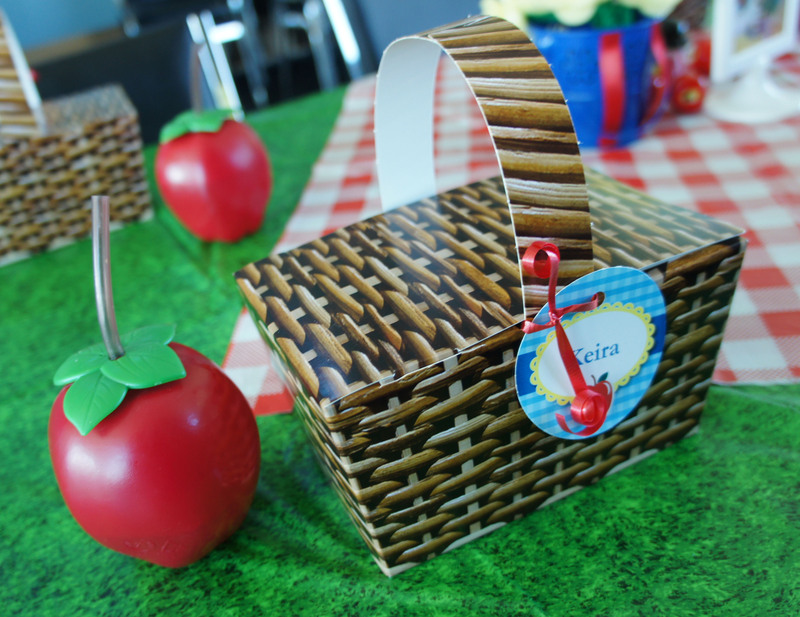 I ended up finding these adorable picnic favor boxes on birthdayexpress.com and decided to make individual boxes lunches full of finger foods for each of the little party guests. I also can’t say enough how happy I was with the quick shipping and service from Birthday Express and will not hesitate to use them again for future party supplies. My kids favorite lunch is simply sliced garlic sausage, cucumber, cheese and crackers. It is quick and easy for me and I know they will actually eat it so I used that as my inspiration for the kids baskets. 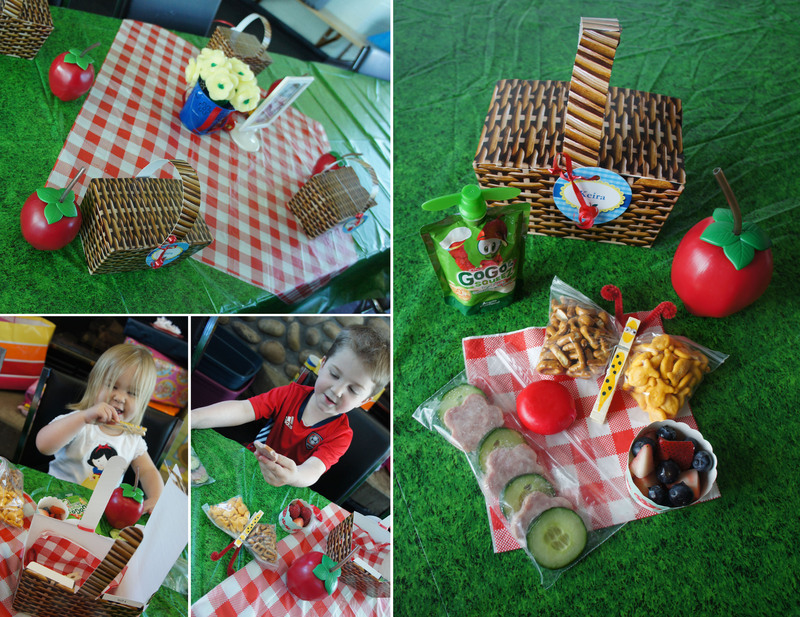 The final baskets contained small bags of sliced cucumber and garlic sausage cut into flower shapes, a Babybel cheese, small cup of mixed berries, a squeeze pouch of applesauce and packets of goldfish crackers and alphabet pretzels that I crafted into a butterfly using a clothespin, googly eyes and pipe cleaners. Each child also got an adorable apple shaped sippy cup that I filled with apple juice before the party. For the adults I had a selection of croissant sandwiches and tortilla rolls I ordered from the deli at Safeway. They have a great selection of party platters and I found them one of the easiest to order from since they had pictures of everything online to look at beforehand. 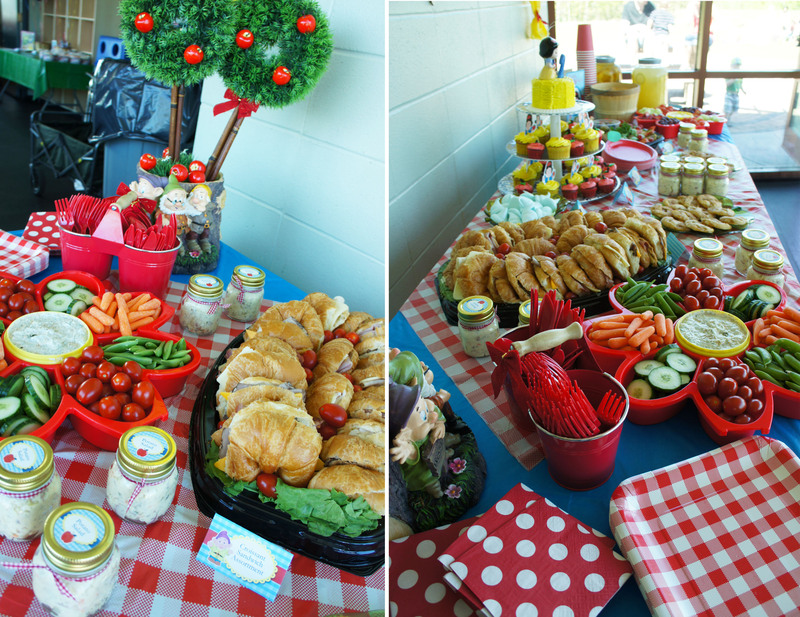 Other foods were fruit with dip and veggies with dip served out of the cute daisy shaped platters and potato salad served from tiny jars. I found the little jars for the potato salad during one of my frequent trips to Dollarama. My initial thought was they would make adorable favors filled with jellybeans or M&M’s, but I already had the favors covered and really didn’t need more sweets for the party. 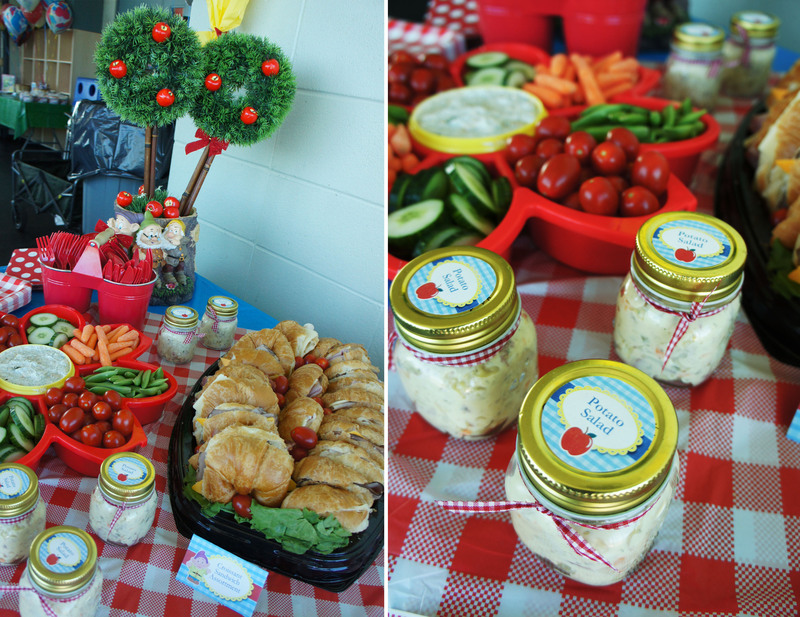 The jars with their plaid ribbon were too cute not to pass up so I tried to think of savory items I could fill the jars with and potato salad seemed to fit the picnic theme perfect! After they were filled, I finished them with sticker labels for the tops I created to match my other party printables. 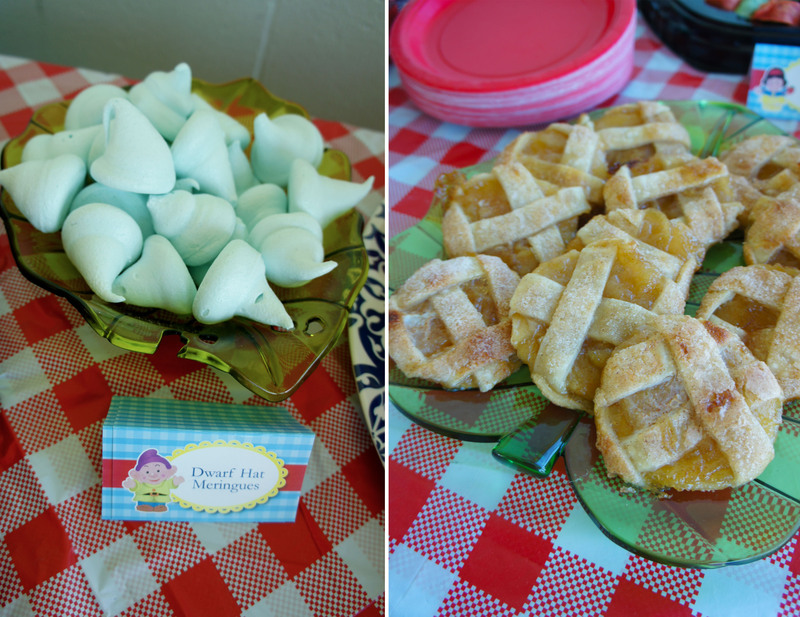 To satisfy everyone’s sweet tooth, I baked up caramel apple pie cookies, “dwarf hat” meringues, and, of course, cupcakes. I also bought some candy popcorn from Kernels to use both in the favors and for snacking at the party. Drinks were apple iced tea and a lemonade punch. I found the Aladdin drink dispensers at Walmart for $10 each and am super happy with them. The last dispenser I bought was all kinds of leaky so I am happy to report that so far these haven’t leaked at all and will be something I can reuse for future parties. The cake was my first attempt at a ruffle cake and I was so proud of the way it turned out! I used a little 4″ pan to bake the mini cake for Keira and it was topped off with a Snow White ornament I found at Target at Christmas and a blue sparkly “2” candle. 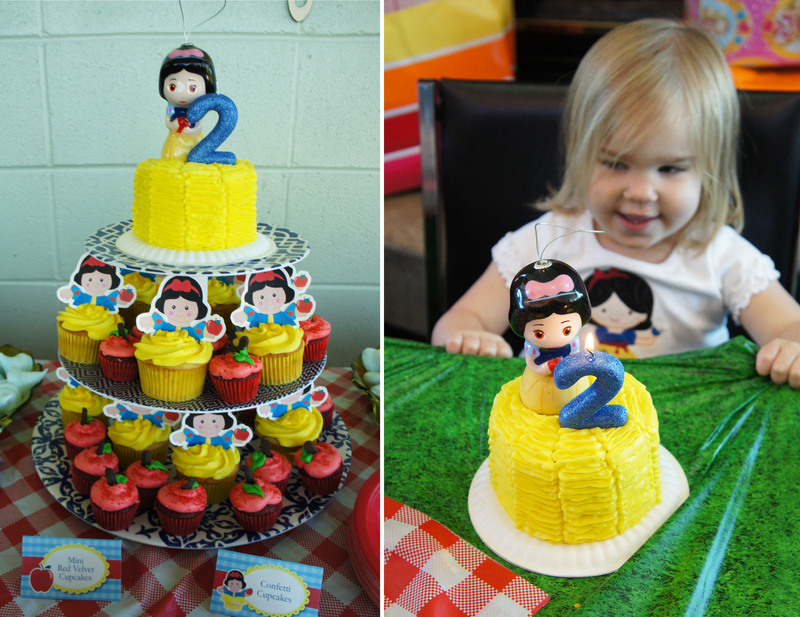 For the cupcakes, I kept my big and little guests in mind again and decide to do both full sized and mini cupcakes. The full sized were made of confetti cake (chosen by the birthday girl herself) with a cream cheese icing, while the mini apple cupcakes were red velvet with the same cream cheese icing. 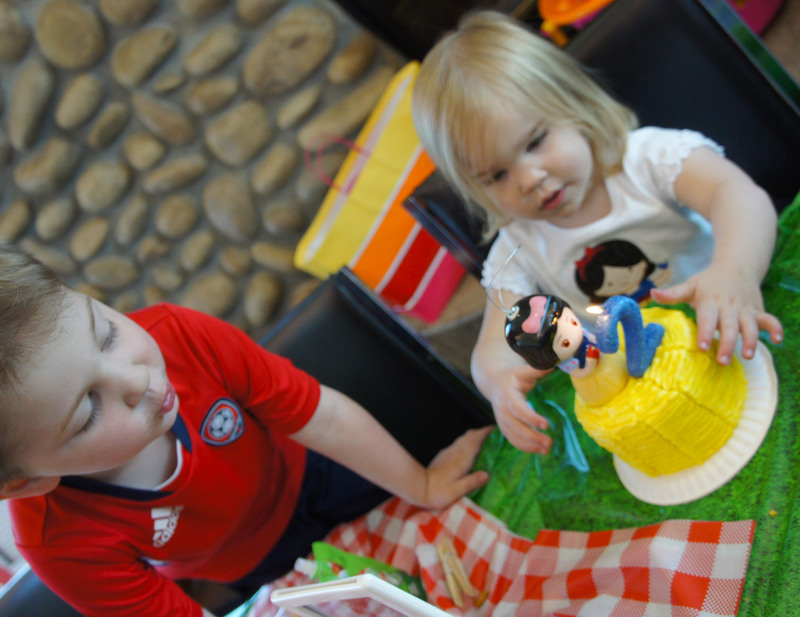 The paper Snow White toppers were designed, printed and cut myself from photo paper and attached to sucker sticks to insert into the cupcake “skirts”. To create the apple cupcakes, I simply piped melted chocolate onto a cookie sheet and froze it for the stems and then got practice using my leaf tip to pipe on the green. 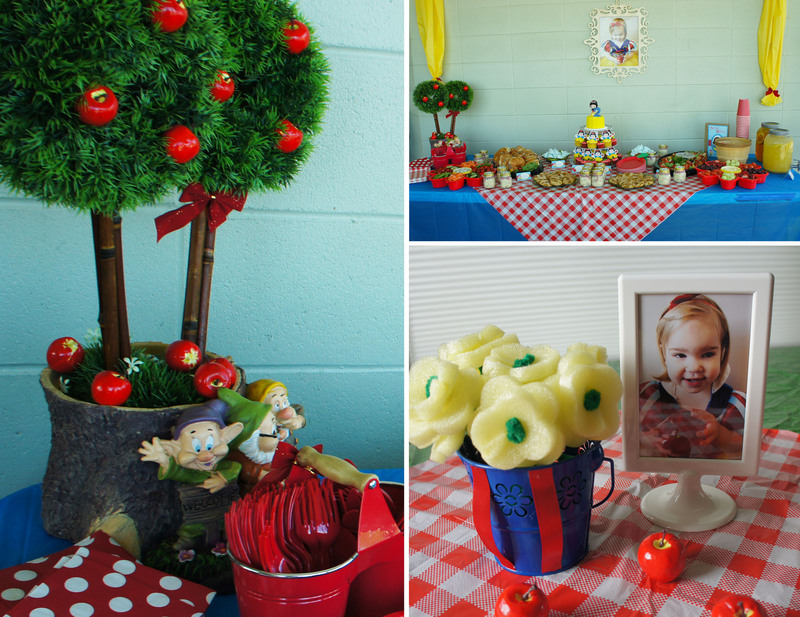 Continuing with the apple theme, the cupcakes were also served on apple shaped plates I made by gluing hand cut leaves and stems onto red paper dessert plates. The favor table was a bit of a happy accident. 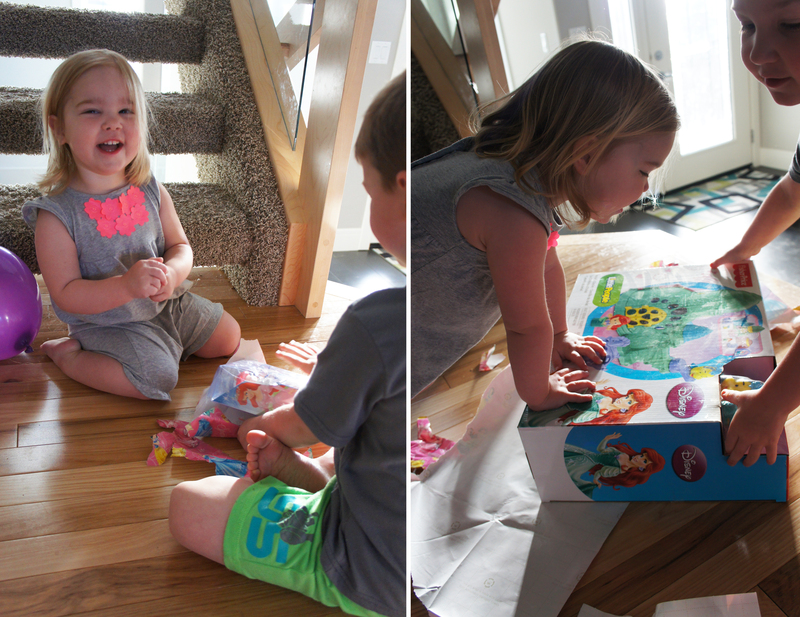 I had already decided on my theme way last summer so when I found Snow White storybooks and Pez dispensers at Dollarama, I picked up a bunch. At that point I was thinking that we would have far fewer guests, so I didn`t have enough of any one item to give to all the kids. 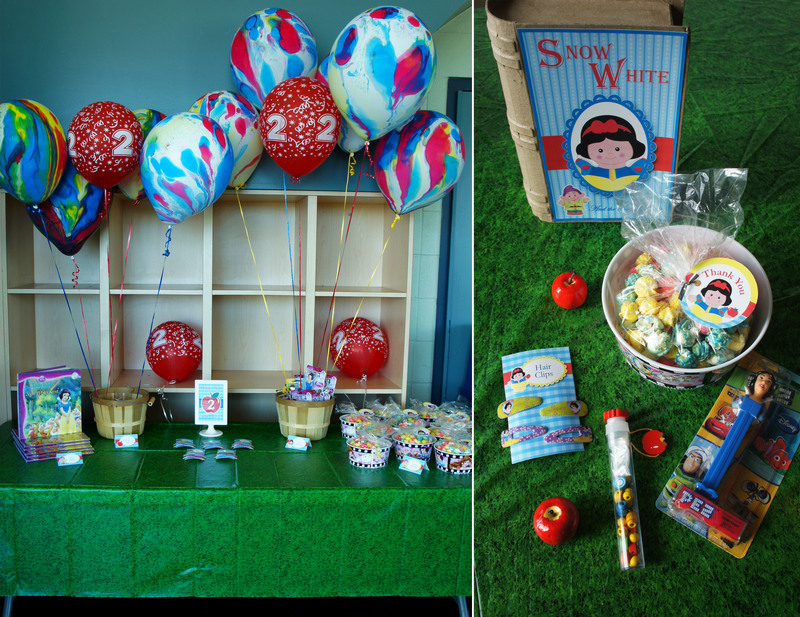 I found a few other Snow White themed items and ended up setting everything out with a sign inviting each child to pick two items. Besides the books and Pez dispensers, we also had apple themed bracelet making kits, Snow White hairclips and candied popcorn in plastic Snow White bowls. The balloons were a bit of a last minute addition since I know how much my kids love getting helium balloons and I tied the Pez dispensers and bracelet kits to them as weights. 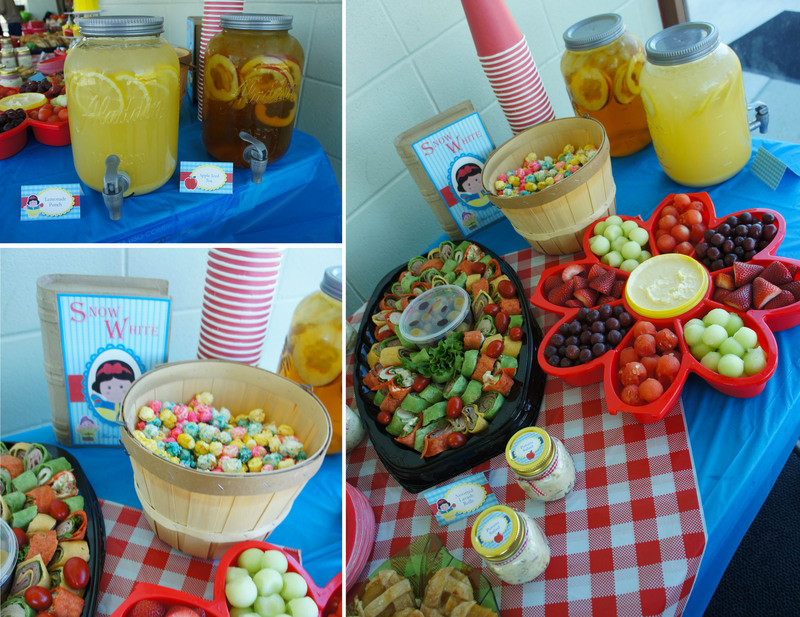 The kids all seemed to really like being able to choose their own favors so I think this is an idea I will use again for future parties. It turned out to be a perfect day for a party in the park and I think all the kids had a lot of fun at our picnic and on the playground. 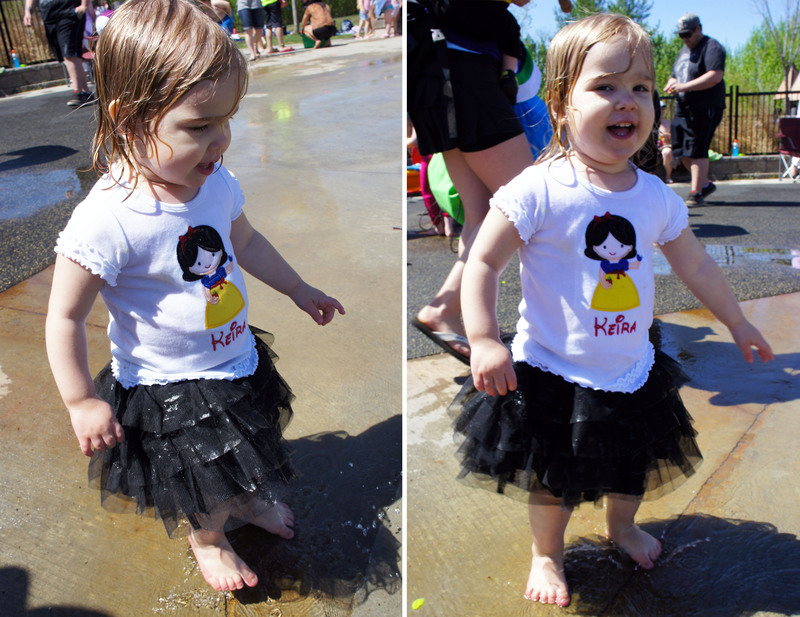 My little birthday girl definitely enjoyed her party, but the best part of her day was getting drenched from head to tutu at the splash park at the end. 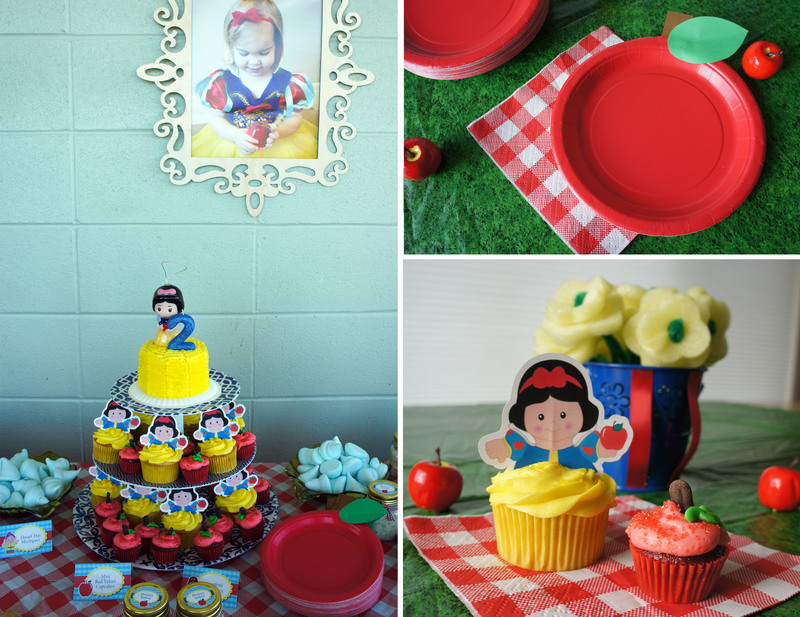 And as always, I have a party planning board on pinterest if you are looking for other great Snow White Party ideas! Hi! May i ask where you bought the apple shaped sippy cups? How much? Thanks! Hello, where can I find the basket goodie bags? thank you!